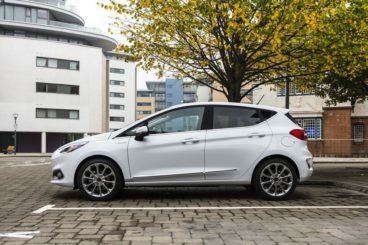 The new Ford Fiesta Vignale Diesel Hatchback is the luxury, highest-spec version of the popular supermini. This means it’s also the most expensive version, and costs over £21,000. For that, you get the Fiesta with all the trimmings. This means a fun driving experience and a top-notch cabin that comes complete with chrome trim and heated quilted leather seats. It’s basically the enhanced version of what’s already the best car in this sector. Sound good? Ford was established over a century ago, and has grown from strength to strength. To find out more about the history of Ford read our summary. OSV takes a closer look at what it’s all about with our 2018 Ford Fiesta Vignale Diesel Hatchback review. The Fiesta never used to be the best car to drive in this class, but things changed around the year 2000 when Ford decided they were going to up the Fiesta’s game. Since then, the car has evolved into a very exciting proposition whose driving dynamics are equalled by no one else in this sector. The thing is that Vignale buyers might feel a tad ripped off because despite costing £8,000 more than the entry-level model, this top-spec version drives no better. That’s not Ford’s fault, of course, because all models are super fun and what you’re paying extra for are the luxuries. The new model boasts even lighter steering than last time, and this makes the car entertaining and easy to drive in the towns and cities. Body roll is well resisted in bends, and there’s a decent amount of feel from the wheel. The front end is pretty grippy too, and this lets you can take corners with a bit of enthusiasm. Ride quality is good for the most part, even on some of Britain’s harsher surfaces. The main reason for this is that the Fiesta is such a light car. The Vignale model is heavier than the entry-level variant and tips the scales at around 1,200kg, but it still copes with lumps and bumps well. Moreover, all models are lighter than a lot of the car’s rivals. In terms of the engines, a 1.5-litre TDCi diesel engine is remarkably refined. It was available in the outgoing model, but Ford have upped its power output to 118bhp. Clatter is kept to a minimum, and although you do have to work it hard it never becomes too noisy. It can get you from rest to 62mph in 9.0 seconds flat, which is pretty zippy. Alternatively, you could settle for an 84bhp variant of the same engine, which covers the 0-62 dash in 12.5 seconds. 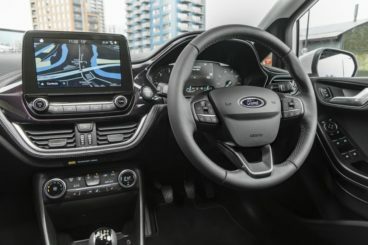 The Fiesta Vignale gets treated to a stylish cabin, and there are some genuinely luxurious touches in here, including the aforementioned heated quilted leather seats. However, it isn’t the most special cabin in this class, and some rivals can boast even more quality. Ford have used what they call their Global B platform, which was used on the previous Fiesta. As such, the car’s cabin looks and feels a lot like its predecessor. That’s not a bad thing at all, and Ford have used less harder plastics inside than ever before. A hefty tablet-style touchscreen dominates the dashboard, and Ford have placed the heater controls lower down. There are a lot less buttons than there were in Fiestas of old, and this is great news. Overall, the design is simple but tasteful and easy on the eye. Is the Ford Fiesta Vignale Diesel Hatchback practical? As well as being easy to drive and easy to park, visibility is decent but could be better (thick C pillars spoil things a bit), but the fact that the Vignale trim gets a reversing camera as standard is a bonus. Interior space is better than last time, and the Fiesta is now a genuine family car. Plus, you can choose from either a three or a five-door model. The boot, meanwhile, measures 292-litres when the parcel shelf is in place and 1,093 when you remove it and fold the rear seats. Is Ford a reliable brand? Read our unbiased assessment of Ford’s reliability. As well as all the standard kit of the lower-spec models (which we’ll cover in a second), the Fiesta Vignale spoils you with a few handy extras such as parking sensors and a rearview camera, as well as some touches of luxury that go some way to justifying its price, such as heated quilted leather seats, a full-length panoramic sunroof, more chrome trim, and uniquely styled fog lamps, grille and front bumper. Other than that, it also comes with a B and O audio system, a heated steering wheel, an 8” infotainment system, keyless go, cruise control, and all Vignale models give you access to your very own Vignale Relationship Manager. In terms of how safe the car is, the Fiesta scored 5/5 when it was crash tested by Euro NCAP. It’s structurally stronger than last time and scored especially well for adult and children occupant protection. Its standard safety kit is a bit sparse, however, and while all models come with lane keeping assistance and lane departure warning, traffic sign recognition and autonomous emergency braking are optional. Prices for the highest spec Fiesta are around £21,680. For more information on our leasing deals, you can check out our page here. In terms of its running costs, this might be a pricey, upmarket Fiesta, but it still comes with typically low diesel running costs. The 1.5-litre 84bhp diesel engine is the star of the show with its incredible returns of 88.3mpg economy if you stick to the three-door variant. It also emits just 82g/km of CO2, which qualifies it for a BiK rating of 20%. Opt for the five-door variant and those numbers change to 85.6mpg and 84g/km. A bigger 118bhp variant is more expensive to run but still super economical. It can return 80.6mpg on a good day and has the same 20% BiK rating. Even the lower spec models have the look and feel of a premium product these days, but this Vignale trim takes things up a notch. No other supermini can match the Fiesta for handling dexterity. You’ll have a ball. All diesels can return over 80mpg economy. Whoever seriously thought that a Fiesta would one day cost upwards of £21,000? Rivals are able to offer more competitive deals. Let’s see how the car fares against its rivals in the comparison section of our 2018 Ford Fiesta Vignale Diesel Hatchback review. 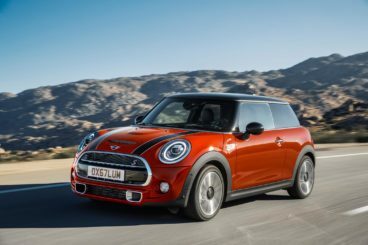 The new MINI Cooper is an exciting version of the MINI Hatchback. It’s lots of fun to drive and looks easy on the eye. All models in the range are a treat to drive but the MINI Cooper S is the standout model that can make anyone smile. This is largely due to its extra power. It’s super sharp, grippy and there’s plenty of feel from the wheel. Backed by a four-cylinder 2.0-litre petrol engine it can complete the 0-62 dash in 6.8 seconds and develops 189bhp. It’s comfortable, refined and makes for a fantastic all-rounder. It comes paired up with an excellent manual gearbox as standard, but if you want you can specify the seven-speed automatic transmission, which is brand new for 2018. If you want more power, a John Cooper Works model tops the range. It produces a whopping 228bhp, (which for a car as small as this, seems unnecessary) and has a 0-62 time of around 6.1 seconds. Meanwhile, a much smaller Cooper D diesel model sits at the lower end of the range with a 1.5-litre 115bhp engine. Running costs? The Cooper D is the most frugal and can return 72.4mpg at best. You probably won’t see that on a day to day basis, but even if you average 65mpg it’s still very good. Meanwhile, the Cooper S can return 47.1mpg on a good day. Inside, the MINI Cooper looks fantastic; it’s more mature than ever, well built and everything is neatly arranged and presented. The driver sits down low, and the steering wheel, gear lever and pedals are all perfectly positioned. You’ll feel less hemmed in than last time, and MINI have finally replaced the massive central speedometer with a 6.5” infotainment screen. Is the MINI Cooper practical? It is and it isn’t. A 211-litre is way too small for any class, and while rear seats can be folded to increase space, there should really be more space with the seats up. Other than that, interior space is a bit better than last time and access is fairly easy. Adults will struggle in the rear on longer journeys but kids should be just fine. Storage solutions are here, there and everywhere, and the MINI Cooper gets a glovebox and a “hidden” cubby on top of it. 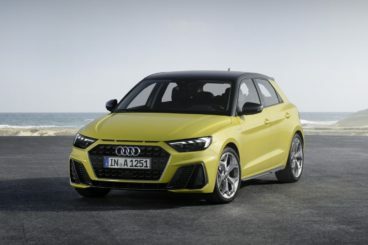 The Audi A1 is a stylish, upmarket alternative to the Fiesta that’s actually cheaper to buy if you stick to the lower spec models. On the road, the Audi performs decently and is a more-than-capable handler. It’s not as much fun as the Ford or the MINI, and indeed feels more grown up than them both. It’s a question of priorities: Do you want some youthful exuberance and excitement? Or do you want a more sophisticated, adult and upmarket driving experience? If it’s the latter, the Audi is the one for you. In terms of its engines, there’s only one diesel available. It’s a 1.6-litre unit that completes the 0-62 dash in 9.4 seconds but it lacks the same smoothness of the petrols. That said, if you’re planning to make lots of trips on the motorway, it makes a lot of sense. It comes paired up with a 5-speed manual gearbox and can return 76.3mpg, which makes it the most economical in the range. It also emits less than 100g/km of CO2 and sits in insurance group 19 out of 50. Inside, the A1 stands out in this review with its premium cabin. Pretty much every single aspect in here can be customised, from the colours to the steering wheel. Whatever you do to it, you’ll have a top class, luxurious interior (provided you avoid the brasher colour schemes, at least) but comfort is dependent on which model with which wheels you choose. Is the Audi A1 practical? It’s only available with three doors, but an A1 Sportback version comes with five doors. It’s longer than the MINI Cooper, and this means that legroom is decent. Still, it’s a compact car that’s easy to park. It comes with just two rear seats, a sloping roof limits rear headroom and the boot measures 270-litres. Fold the rear seats and you can extend that to 920-litres. It’s got driver appeal, your passengers will love it and there’s now enough room for a growing family. The new Ford Fiesta Vignale Diesel Hatchback is upmarket but dirt cheap to run, super stylish and lots of fun to drive. It’s the small car to put a smile on your face.